Before June closes for good, there are two more reviews to be posted here on SuperPhillip Central. The first is a tease at what's coming next month-- a month of PlayStation 4-centered reviews! The version played of EastAsiaSoft's Lost Sea was the PlayStation 4 build. See how the overall game is with the official SuperPhillip Central review! More fun than Gilligan's Island! Less fun than Pirates of the Caribbean! Summertime is here, and many are taking vacation trips to tropical locales. The last thing people expect going to a tropical isle is to be marooned on an uncharted island or lost within the Bermuda Triangle. ...But it happens! All you need to believe this is see EastAsiaSoft's Lost Sea. ...Oh, wait. I've just been informed that Lost Sea is merely a fictional video game and not at all based on fact. Still, Lost Sea is a rather nice getaway if you've looking for a vacation away from home and you're stuck doing a "staycation" instead. Sure, it has some hair-pulling and frustrating moments and design flaws, but no one said being lost in the Bermuda Triangle was going to be easy! 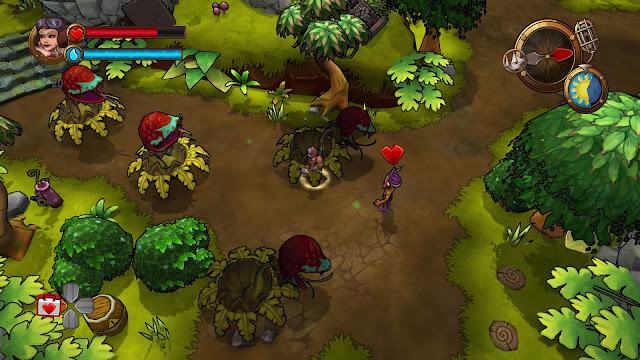 The main gameplay loop of Lost Sea has you exploring procedural generated (read; randomly concocted) islands made up of different hexagon-shaped parts. The goal of each island is to at least collect one tablet strewn about the island and bring it back to the dock where your ship is. Doing so will open up a new island at random for you to move to. Picking up more tablets per island is always to your benefit. That way you have a grander choice of islands to choose from. Some islands are more difficult than others, while other islands house rare treasure that you can collect, permanently adding it to your assortment of golden goodies. 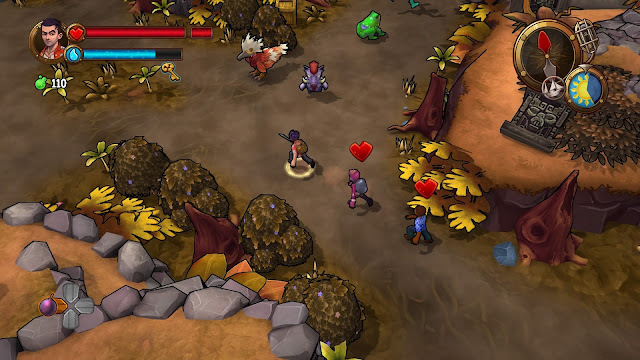 Along the way of venturing across the wilderness of the islands, you'll come across countless monsters and enemies that need defeating and will make no hesitation to come after you. As you reach new worlds, the enemy variety increases as does the difficulty to dodge their attacks. Through defeating enemies, your avatar earns experience points that can be used to purchase new abilities and bonus benefits from the captain of the ship at the dock. These include things like the ability to sprint, a chance for enemies to drop healing items, increased health and stamina, and a lot more. All you have is a sword to slice and slash through danger, but that's really all you need! However, you're not the only person marooned inside the Bermuda Triangle. No, there are folks sprinkled around the various islands of Lost Sea that can join your cause and assist you on your journey home. While these crewmates don't have any attack abilities of their own, their worthiness comes from the side benefits they give you. For one, they can carry tablets so you can keep your hands free to attack enemies, destroy boxes and barrels, and slice through various foliage. Some have the ability to build bridges, mine items, unlock treasure chests, and some even have an ultra-helpful halo over their heads, allowing a one-time revival of your character if they lose all of their health. Though crewmates are not without their drawbacks. They will sometimes get caught on geography in levels, making you go back for them, and secondly, they aren't invincible. Once their own health is whittled away, they're gone for good. Three pairs of arms are better than just one, especially when it comes to transporting tablets. Lost Sea is pretty unforgiving under its welcoming cel-shaded art style, chipper music, and cute aesthetic. Your character's death results in losing all of their abilities, earned experience, earned ship upgrades, and progress, This means you have to restart anew as a new character, but thankfully, if you've reached a certain world, you can warp to the beginning of that world when you start as a new character instead of having to play from the very start of the game. However, you do have to gain experience and abilities all over again, and it can be pretty hard to get reacquainted to losing abilities you had like being able to sprint, for instance. It can also feel like the winds have been taken out of your sails when you realize all your progress save for worlds you've reached and what treasures you've discovered are gone. Fi, fi, fo, fum, these giants are slow and somewhat dumb. One big problem with Lost Sea is the total lack of a quick save feature. When you start an adventure, there is no means to save your progress. Considering that a given island can take 5-15 minutes to complete, there being multiple islands per world you have to visit before facing the boss, and all of the five worlds there are to complete, and you have a lengthy play session ahead of you. You have to do everything in one sitting, which is incredibly old school and antiquated as a feature for a 2016 release. 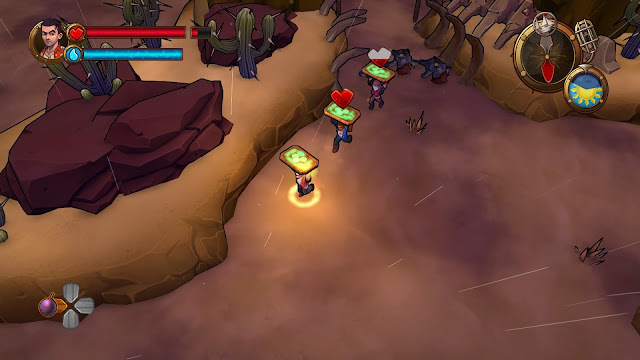 That aforementioned quick save feature that is missing here in Lost Sea could have made the game much more manageable, less stressful, and more fun. 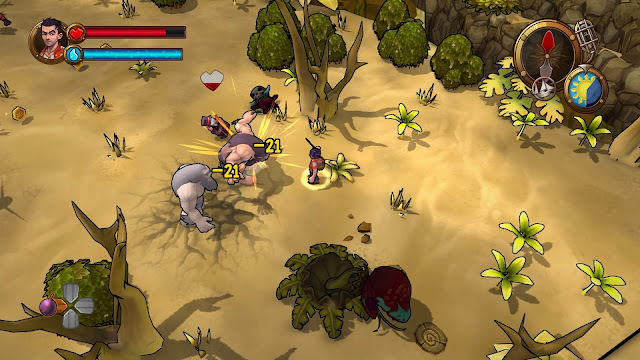 Lost Sea's performance at least on the PlayStation 4 is quite good. The cel-shaded visuals of characters look mighty fine, and the environments are bright and suitably cartoon-y. I only encountered some slight stutter, but this occurred so rarely that it was negligible. The sound side of lost Sea features some catchy music to explore the various islands with, and the quick, one-word responses by crewmates sound charming, especially when they come out of the PS4 controller. Overall, Lost Sea's presentation is nowhere close to a shipwreck. Nonetheless, overall as a game, Lost Sea is frustrating because beyond the irritating design choices and flaws here, there's a really good game to be found. It's just the game's apparent desire to punish those who want to play in spurts as well as its harsh penalties upon death make for a game that is a tad challenging to fully recommend and be 100% engaged with 100% of the time. Lost Sea is the type of video game that neither sinks to the bottom of the ocean like an anchor, nor does it float lifelessly to the top. It's just somewhere in the middle, struggling to have players enjoy it completely. PlayStation 4 review copy provided by EastAsiaSoft.